恐れ入りますが、このホテルに関する詳細はまだ日本語に訳されていません。 Let’s face it, most hotels fundamentally more or less the same. So what’s unique about Hotel Unique Fethiye? First is the location. 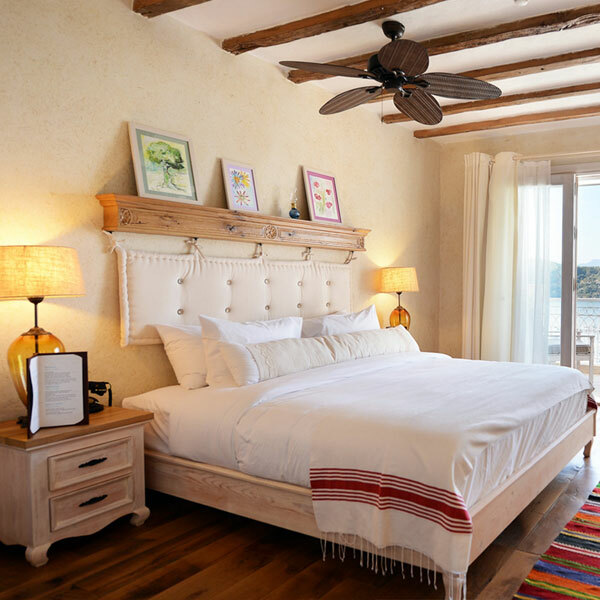 A rocky cliffside, especially one that rises on such a steep incline above Fethiye’s marina, might not seem like the most obvious place to break ground for a new boutique hotel. But that’s exactly what you’ll find here: clever landscape architecture. 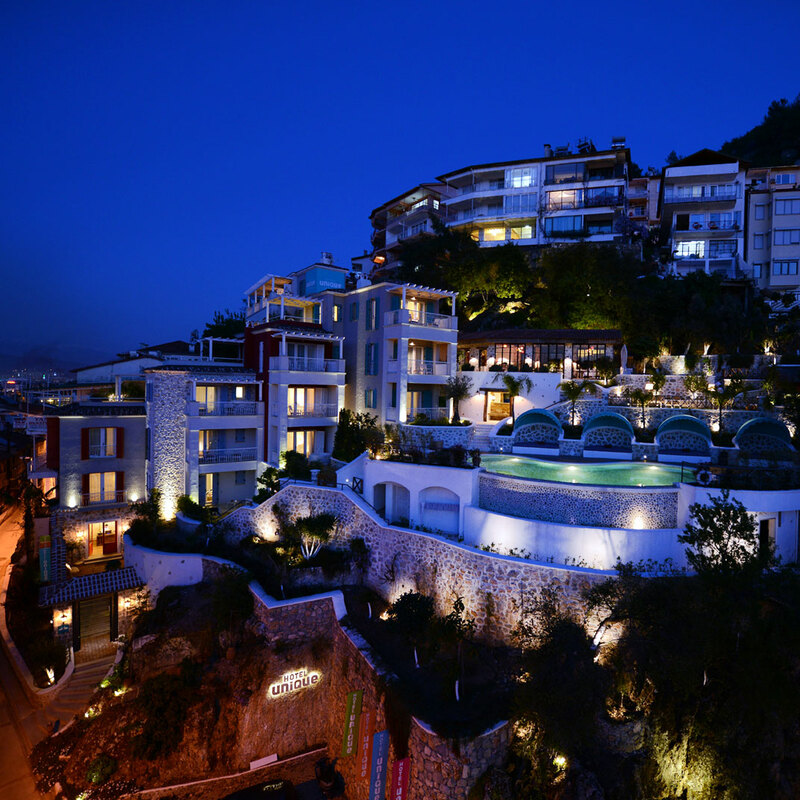 The cliff has been sculpted into a series of terraces, with nineteen guest rooms and suites at varying levels. What else is unique? There’s the landscape architecture, and then there’s the architecture architecture. 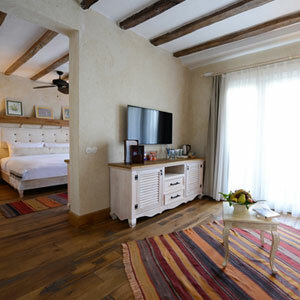 The hotel is new and the aesthetic modern, but take a closer look at the building materials — the rustic wooden beams and heavy stone were salvaged from old constructions that used to occupy this particular patch of real estate, as we vintage-looking design details from carved doors to cheerfully painted wooden shutters. 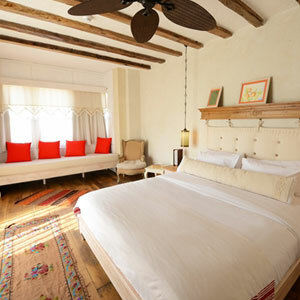 The timeworn materials add character and depth to a hotel that’s practically brand-new. 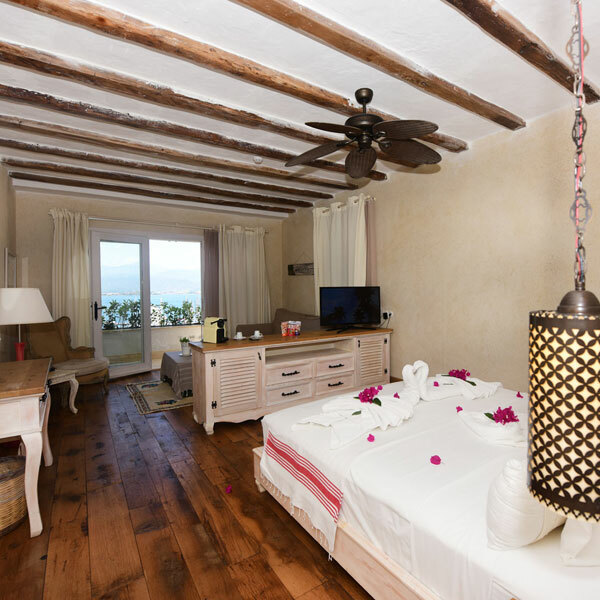 Some of those old beams and stone are visible inside guest rooms, as well, where floors and furnishings are made of pale wood and windows or balconies open to views of the sea or the mountains. Amenities include flat-screen Smart TVs, free wi-fi, a pillow menu, and spacious bathrooms with rain showers and products by L’Occitane. Upgrade to a deluxe room or suite if you require your own private outdoor whirlpool; otherwise, wander down to the Hotel Unique’s lovely swimming pool and sun deck, or check yourself into the Turkish hammam for a massage, or relax with a cup of tea or an al fresco lunch while enjoying the view over the Turquoise coast. “Turquoise” is French for “Turkish,” and it’s also the color of the water at the point where the Aegean and Mediterranean Seas come together. This is a destination with a lot going for it: gorgeous beaches are within easy reach, and thanks to the region’s ancient Lycian history, ruins aplenty to explore. Hop on one of the Hotel Unique’s complimentary bicycles — you’ll pedal past ruins on the way out — or if your budget allows, book the Octobre Rouge, the hotel’s private yacht, for a look back at the dramatic coastline from the sea. Please note: Hotel Unique Fethiye is a small property with only 19 rooms. Hotel Unique Fethiye is as An Adult only Boutique Hotel.